ww2dbaseJonathan Mayhew Wainwright IV was born at Fort Walla Walla, Washington, United States to Army officer Robert Powell Page Wainwright, a veteran of the Spanish-American War. He graduated from West Point in 1906 and served with the 1st Cavalry Brigade as a commissioned officer until 1908. He saw some combat on a tour in the Philippines before he was sent to France during WW1 in 1918. By the end of WW1 he achieved the permanent rank of Major. During the interwar years, he taught at the Cavalry School at Fort Riley and served at various cavalry units. ww2dbaseIn Sep 1940, he was promoted to the temporary rank of Major General and sent to the Philippines under General Douglas MacArthur. When the Japanese invaded the Philippines in Dec 1941, Wainwright was MacArthur's right-hand man in executing the delay action plan to move the troops to Bataan and Corregidor. He became the Allied commander in the Philippines when MacArthur was ordered to go to Australia to assume the position of Allied Supreme Commander. "Goodbye, Jonathan," MacArthur said, in a rare fashion addressing Wainwright by his first name. "When I get back, if you're still on Bataan, I'll make you a lieutenant general." Wainwright responded, heroically and completely ignoring the promise of promotion, "I'll be on Bataan if I'm alive." After a series of valiant efforts to defend the last American holdings in the Philippines, Bataan surrendered on 9 Apr. Lacking food and ammunition, Wainwright and his troops fought on at Corregidor, not surrendering until 6 May. He became a prisoner of war in Japanese camps in Luzon, Taiwan, then Manchuria in northeastern China; he was liberated by Soviet troops on 16 Aug 1945. During his time in Manchuria, he traded everything from pens to wrist watches for information on MacArthur's advance. When he had heard that MacArthur landed on Leyte, he thought, as he later wrote, "Douglas, true to his promise to me on Corregidor... had come back... come back with a great fleet to support him and manpower beyond the dreams of defeated commanders such as ourselves." His surrender at Corregidor in 1942 haunted him through the entire time he was captured, thinking that he had failed his nation. One of his first questions upon meeting another American was "how am I thought of back in the states?" I rose and started for the lobby, but before I could reach it, the door swung open and there was Wainwright. He was haggard and aged.... He walked with difficulty and with the help of a cane. His eyes were sunken and there were pits in his cheeks. His hair was snow white and his skin looked like old shoe leather. He made a brave effort to smile as I took him in my arms, but when he tried to talk his voice wouldn't come. For three years he had imagined himself in disgrace for having surrendered Corregidor. He believed he would never again be given an active command. This shocked me. "Why, Jim," I said, "your old corps is yours when you want it." 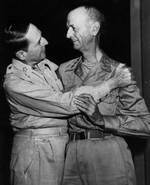 ww2dbaseWainwright, arm-in-arm with MacArthur, could only respond with "general..." before he broke down in tears. MacArthur did not notice at the time of the reunion, but afterwards he realized that the cane Wainwright walked in on that evening was a present from MacArthur before the war; he had kept it near him through the years in the prison camps. It was given by MacArthur so that his friend, a fellow general, could use it as a swagger stick, a symbol of his rank; ironically, Wainwright used it to support his weakened weight and defeated spirit. ww2dbaseAfter the war, he became a four-star general and commanded the US 4th Army at Fort Sam Houston, Texas, United States. He retired from the Army in Aug 1947 and passed away in 1953. He now rests in Arlington National Cemetery, Virginia, United States. 23 Aug 1883 Jonathan Wainwright was born in Fort Walla Walla, Washington, United States. 10 Mar 1942 Jonathan Wainright's car was strafed by Japanese fighters on Bataan Peninsula, Luzon, Philippine Islands in the morning as he inspected forward areas. At noon, he traveled to Corregidor as requested by Douglas MacArthur, who informed him that President Franklin Roosevelt had ordered MacArthur to depart. 12 Mar 1942 Jonathan Wainwright took over command in the Philippine Islands. 20 Mar 1942 Jonathan Wainwright received the official US War Department order promoting him to the rank of lieutenant general and placing him charge of US troops in the Philippine Islands, replacing Douglas MacArthur, who had been ordered to go to Australia by Franklin Roosevelt. 16 Aug 1945 Jonathan Wainwright was liberated from Japanese captivity in Liaoyuan, Liaobei Province, China. 25 Aug 1945 Jonathan Wainwright arrived at Chongqing, China. 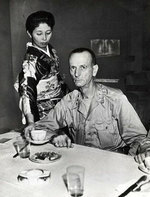 30 Aug 1945 Jonathan Wainwright arrived at Manila, Philippine Islands. 2 Sep 1953 Jonathan Wainwright passed away in San Antonio, Texas, United States. Lieutenant General Jonathan Mayhew ‘Skinny’ Wainwright was a polo-playing cavalryman of the old school, who usually wore riding breeches and hat. He arrived in the Philippines in 1941 to command the Philippine scouts. He was popular with the soldiers, for he could speak their language and understood their needs. In the final days of the long siege of Bataan, when all hope of rescue and long since passed and everybody waited for the Japanese onslaught, Wainwright spent much of his time in the front line. Later, in the siege of Corregidor, he toured the trenches and gun pits, talking with his men. In the Manchurian prison camp he was extremely badly treated by the Japanese guards which left him severely emancipated and able to walk only with the aid of a stick. After the war, Wainwright was appointed to head the Eastern Command in the United States. There are very few military leaders I detest as much as Dugout Doug. After the PI had finally fallen, he was quoted as deriding Wainwright for surrendering, insinuating he'd have done a better job. The man was an insufferable egomaniac with very few redeeming qualities. He and Montgomery would have loved each other. William Taylor, General MacCarthur was ordered out of the Philippines By President Roosevelt and he was following orders. He was already a national hero and if he was captured or killed it would have been bad for the morale of the country. That was the thinking of senior membership including General Marshall a man that was given a bad evaluation by General MacCarthur. MacArthur had a great many flaws, overweening vanity being first and foremost, but all the evidence indicates he was a complete stranger to physical fear and being a physical coward was literally impossible for him.